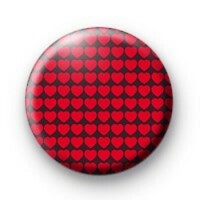 Red Love Heart Pattern Badge. This 25mm badge has lots of simple hearts in rows. It is a classic love badge and would add a little spark of romance to your outfit and help you spread a little love. Our badges are a sweet handmade way of brightening up anyone's day and our Valentine's badges are ideal to give as small tokens of your love.